Species name meaning 'from the Moluccas'. Albizia falcata (L.) Backer ex Merr. Large, fast growing trees. Stipules present, but dropped early. 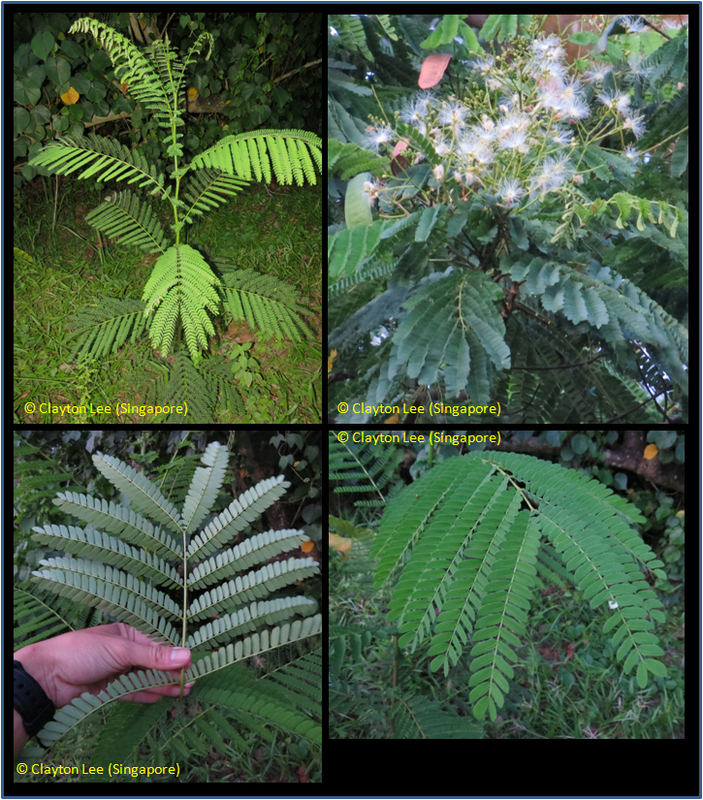 Leaves alternate, bipinnate compound, up to 40 cm long, with glands on the rachis, each pinnae with many small leaflets (up to 25). Flowers in panicles, consisting of many long stamens, white-pinkish. Fruit a papery straight pod up to ca. 11 cm long, narrowly winged along the suture, opening on both sides, with many green, up to 7 mm diameter flat seeds. Native to the Moluccas, New Guinea, the Bismarck Archipelago including the Admirality Islands and the Solomon Islands. It is widely planted throughout the humid tropics. English: batai (trade name), Peacock's plume. Indonesia: jeungjing (Sundanese), sengon laut (Javanese), sikat (Banda). Malaysia: batai (Peninsular, Sabah), kayu machis (Sarawak). Papua New Guinea: white albizia.